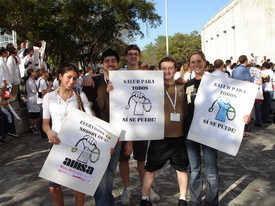 HOUSTON – About 1,000 medical students and their supporters held a rally here at city hall Mar. 14 to demand healthcare for all. The event was organized by the American Medical Student Association (AMSA) as part of its annual convention and supported by the local SEIU and Justice for Janitors movement. Two fourth year medical students from the Baylor College of Medicine in Houston, Jessica Dalby and Stephanie Wuest, expressed strong support for the goals of the rally. Medical student Flavio Casoy, an organizer of the event who works with the AMSA, described some of the AMSA’s history. “AMSA used to be a part of AMA (American Medical Association) until 1968,” he said.